Service 24/7, and 365 days a year! 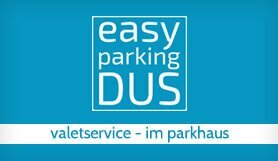 Use easyparkingDUS's reliable valet service. Drive directly to the airport, where you will hand over your vehicle to one of the experienced and insured drivers. While you are on your way to check-in, your car is driven to the nearby parking lot of easyparkingDUS, which is monitored 24 hours day and night. Your car is safely parked until you return from your trip. On the day of your return, you are expected by an easyparkingDUS employee with your car and can make your way home without delay. Valet Parking is an excellent solution for disabled passengers, as you travel in the comfort of your own car and can park in front of the departure terminal, only a few meters away from the check-in. Please print out your booking confirmation and take it with you on the day of your departure. Book a car wash service directly at the car park. Staff will be happy to give you additional information on site. Please drive directly to your departure terminal. There, one of the trained staff from easyparkingDUS will wait for you. After a short car-check, you will hand over the keys to the representative of easyparkingDUS and you will be able to check-in and prepare for the flight while your car is safely parked on the 24-hour secured garages. Your car keys are safely stored for the duration of your trip. When returning, please call easyparkingDUS at the number indicated on your booking confirmation, as soon as you are in the luggage compartment, about 15 minutes before you reach the terminal. You will then be awaited from a parking representative who will hand over your car after another vehicle check.